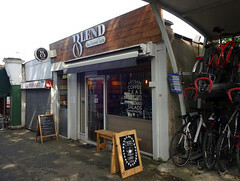 Cafe and coffee/tea shop in Norbury, situated on the short passageway leading up to the western entrance to Norbury Station. It's quite small, seating just ten people inside and a couple more on benches out the front (with a decent view of the trains arriving at the platforms above). Wood features heavily in the decor, with floor, service counter, banquette seating, table tops, and cupboards all formed from slabby, possibly-reclaimed planking. Unfortunately the tables are bolted to the floor quite some distance from the banquettes, making it a bit hard to eat without dropping crumbs. As well as various coffees they offer ten different loose-leaf teas, all in large open-topped paper teabags with plenty of space for the tea to spread out during brewing. Recommended water temperatures and steeping times are written on the tea canisters displayed behind the service counter. Food options are limited but good quality, and include porridge, toast, sweet pastries, brownies, sourdough sandwiches, and bagels. Kake has visited a few times now, most recently in October 2018. On a Thursday morning in May 2018 it was quite lively when I arrived a little after 11am, with four adults plus a similar number of small children having a catch-up over coffee. On a Monday morning in June 2018, there was one other customer when I arrived around 8:45am, and several others were in and out while I was there, mainly takeaway but also a couple sit-in. There was no music on any of my visits, but in October 2018 there was a somewhat distracting YouTube talk show playing. Pesto, cheddar, rocket, and sunblush tomato sandwich (£4.25 in May 2018) photo was really quite good, with a sensible balance of ingredients, plenty of flavour, and good-quality sourdough bread. Egg mayo sandwich (£2.50 in June 2018) was simple but well-executed. There wasn't too much mayonnaise, and the mild flavour of the egg filling was well complemented by the fermented flavour of the toasted sourdough. Smoked salmon, avocado, and cream cheese bagel (£3.50 in October 2018) photo was fine, with a generous quantity of salmon and some nicely-ripe avocado. A cup of four seasons tea (£2 in June 2018) had a beautifully complex flavour. This was a bit of a random choice on my part since the staff member on duty didn't seem to know much about the teas, and when asked about them could only offer a sniff of the canister. Looking at the supplier's website afterwards, this tea is designed to work for up to five infusions, so it's a shame I was only offered one. (On a later visit in October 2018, they were happy to dispense more hot water for additional infusions when I asked.) Iced Earl Grey tea (£2.40 in May 2018) was a little odd — just plain tea brewed extremely strong with ice in it, which ended up unpleasantly bitter. No service charge was added on any of these visits, but there's a tip jar by the till. They have free wireless via XLN Free WiFi, and a positively generous provision of plug sockets (six of them, in a cafe that seats ten). The table positions are not the most comfortable to work on a laptop, though. Accessibility: A small step to get in. Tables are fixed to the floor. No customer toilet (although they previously allowed customers access to the toilet through the kitchen, they had to rescind this access in mid-2018 for liability reasons). Last visited by Kake, October 2018. Opening hours obtained from a member of staff, May 2018. Last edited 2018-10-16 15:42:15 (version 3; diff). List all versions. Page last edited 2018-10-16 15:42:15 (version 3).